The first painting I fell in love with ‘in the flesh’, so to speak, was Botticelli’s little ‘Annunciation’ in Kelvingrove Art Gallery in my home city of Glasgow. So our latest cultural jaunt to London had to include a visit to ‘Botticelli Reimagined’ at the V&A. It’s an exhibition that has divided opinion. Some reviewers have given it five stars, while Boyd Tonkin in The Independent described it as ‘the grossest heap of kitsch and dross ever to litter [the V&A’s] halls’! It’s certainly different and unexpected. Being greeted at the entrance by Ursula Andress rising from the waves in Dr No, while Sean Connery looks on from the bushes like a satyr, was an arresting opening. The first gallery then explores the appropriation of Botticelli’s most iconic images throughout the 20th century, from Surrealist and Pop artists to Dolce and Gabbano, while the second gallery examines the impact of his ‘rediscovery’ on artists in the 19th century, including some fascinating copies by names famous and unknown, and even two outright forgeries. 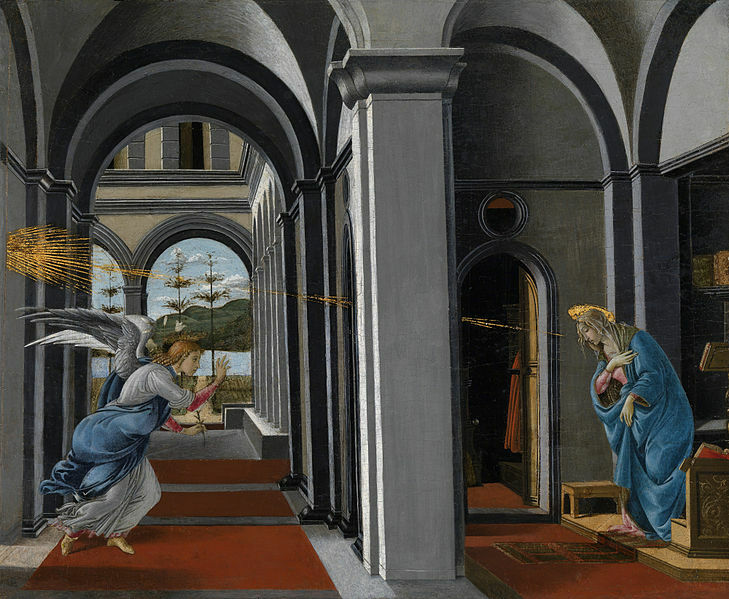 Only in the third room do you reach the real Botticelli—or do you? Because only one signed painting by Botticelli survives: the Mystic Nativity usually in the National Gallery. A key theme of this section is the process by which, over the last two centuries, individual paintings have been attributed, reattributed, and even de-attributed, or at best demoted to ‘workshop of Botticelli’ status. We found the whole exhibition enthralling and thought-provoking, and as I was interested in exploring the controvery which the exhibition has stirred up, I’ve looked at no less than 12 different reviews online, all from reputable publications with paid reviewers, rather than from individual bloggers like myself. What I found revealed, I think, something significant about the state of criticism today, and it isn’t pleasant. The single biggest exhibit in Botticelli Reimagined is a huge video installation, The Path, by the great American artist Bill Viola. Now, such is the complexity involved in setting up Viola’s large works that any chance to see one of them is an event, even in the crowded London art scene. And The Path is one of his most engrossing and moving works, easily the best thing in the whole exhibition, apart from the handful of indisputably authentic Botticellis. So I was interested to see what my clutch of critics had to say about this masterwork. Nothing. Nada. Not a Word. The one honourable exception was Time Out which devoted just 10 words to it, but at least described it as ‘mesmerising’, which it is. I can think of three explanations for this mysterious omission: 1. They missed it. Such a large video installation does, after all, require a room to itself (though that room is right at the start of the exhibition). 2. They don’t rate Bill Viola. Such unanimity on his lack of importance, however, seems highly unlikely. 3. It didn’t fit the shared paradigm. This, sadly, seems to me the most likely explanation. Both those critics who loved the exhibition, and those who hated it, based the bulk of their reviews on the same crude idea of a progression from the valueless clutter and kitsch of the present day to the calm and purity of the 15th century Renaissance. The profound, meditative calm of Viola’s video completely disrupts that false paradigm. Support for this explanation comes from the similar omission of other works in the contemporary section which are also thoughtful and quiet in tone, and demand time to experience, such as that by Michael Joaquin Gray . I think there’s a more profound failure underlying this omission of any reference to the Bill Viola work: a failure to grasp why this exhibition is not at the Royal Academy or the National Gallery, as might have been expected, but at the V&A, ‘the world’s leading museum of art and design’ (my italics). This is not an exhibition about art history but about cultural history, and of the twelve critics I surveyed only one, Kathryn Hughes in The Guardian, got that right and, guess what, she’s a cultural historian. Botticelli Reimagined explores the idea of ‘Botticelli’ as a cultural ‘meme’ (as Richard Dawkins would put it), which lay dormant for three centuries after the death of the artist with that name, only to resurface and begin an extraordinary journey through both high and low culture, having effects (like any cultural meme) that have been both beneficial and adverse. Even in his lifetime ‘Botticelli’ was, as Hughes puts it, ‘a brand’, where the hand of the artist himself may have done no more than draw an initial cartoon as the basis for a stream of devotional images produced by his workshop assistants. If that sounds like anyone today, it’s Jeff Koons or the late Andy Warhol, both, of course, included in the exhibition. The cumulative failure of these critics to address the true complexity of Botticelli Reimagined in favour of simplistic soundbites seems to me a real trahison des clercs. It’s not a good time for professional critics. Shrinking newspapers are shedding staff while the Internet enables pretty well anyone to publish their views on pretty well anything. The question is often asked: do we really need paid critics? My whole background would have inclined me to shout ‘Yes!’ but now I’m not so sure. My favourite podcast is Kermode and Mayo’s Film Review on BBC 5 Live. Mark Kermode recently published an entire book, Hatchet Job, trying to defend the role of the professional film critic. It’s a good read but it smacks of desperation. After all, even Kermode himself often has to admit that reviews which listeners have emailed to his programme are more articulate and insightful than his own contributions. Some of those contributing listeners are not yet in their teens. In my younger days I produced many paid and commissioned reviews for the Glasgow Evening Times, the Glasgow Herald (as it was then), Scotland on Sunday, and even BBC Scotland. Now I use this blog to write unpaid reviews of art, film, books, music and theatre. Setting aside the advantages brought by 40 years experience of working in the arts, blogging lets me discuss subjects at greater length and in greater depth than was ever possible all those years ago in the mainstream media. Sure, these blogs may only be read by a handful of people, as opposed to the thousands who read (or, more likely, skimmed) what I used to write for national media. But perhaps that’s a healthier model—a dispersed series of critical conversations as opposed to a fiat delivered de haut en bas from the elevated status of a national newspaper. We’ll always need people like, say, Mark Cousins, to educate us in the deep history and breadth of an artform like film, but perhaps the role of paid daily or weekly ‘reviewers’ is truly being replaced by technology, and will one day seem as quaint as those ‘explainers’ who used to stand by the screen to tell the stories of silent films, and whose remit was swept away by the coming of sound. Last week Judith and I were in Perthshire for the wedding of Judith’s cousin at the remarkable Fingask Castle . The weather was perfect, the experience was magical. And as we were staying over in the neighbourhood, we decided the next day to make a detour into Perth on our way home. Living as I do in the Highlands, I find that Perth is often an ideal mid-point for meetings with Central Belt colleagues, either at the excellent Concert Hall, or in the very special surroundings of the Royal Scottish Geographical Society’s offices in the Fair Maid’s House. And as Perth Museum and Art Gallery is close to both those buildings, I usually try to drop in, especially as there’s almost always at least one interesting temporary exhibition to catch. So I suppose I’ve called at the Museum once or twice a year for many years now. Well, this time there were no less than three fine exhibitions to enjoy. First, a handsomely presented display about the archaeological finds at the very important site of Forteviot, mounted in collaboration with the Hunterian Museum in Glasgow. This really needed a visit all too itself, there was so much to take in. Then there was a selection of delectable paintings by the late William Littlejohn, this time in association with the Royal Scottish Academy, and nicely linked to a selection of prints from the Ukiyo school. Finally, ‘Life in Miniature’ was a clever and intriguing mixed show from the Museum’s own collection. Plus, Judith hadn’t previously seen the superb permanent display of studio glass, telling the remarkable story of Monart . Add to this the fact that the entire interior was looking fresh as paint (and maybe had indeed benefitted from some recent major redecoration), and we had a thoroughly stimulating and enjoyable experience. All by ourselves. I think we saw one other visitor the entire time we were in (which was about an hour). Now, sadly, that’s not been an unusual experience for me at Perth Museum and Gallery. I’ve quite often been, at best, one of just two or three visitors. We stopped on the way out to tell the receptionist how very much we’d enjoyed our visit, and asked about the lack of visitors. Numbers had been dropping steadily, she told us sadly. But don’t they have lots of school trips, we asked (the displays were very well suited to provide teachers with suitable teaching material)—no, apparently not. The costs of transport, the difficulties of getting permissions. School trips, too, were dropping off. We then went on to the J D Fergusson Gallery, splendidly located in the former Perth Waterworks. The interior was looking all of its 25 years (ie rather tired), and Fergusson is not a favourite of mine—I’d have exchanged all of his paintings for the one exquisite Cadell that was also on show. Nonetheless, again, the displays were very well presented and the staff were friendly and welcoming, but we were the only visitors. This is surely not sustainable. But I find it hard to pin down the cause. In my travels I’ve seen many local museums—both Council-run and independent—that are so tedious, out of date and in dire need of TLC that I’m not surprised that their visitor numbers are alarmingly low. But that’s not the case in Perth. Handsome and imposing buildings, in good locations, housing impressive and enjoyable displays. What’s not to like? Why have they become, effectively, hidden in plain sight for the people of Perth, and indeed for those visiting the city? I can’t help contrasting our Perth experience with what we see when we visit the refurbished McManus Museum and Gallery in Dundee, which is always busy whenever we drop in. Is it just that the McManus, like Kelvingrove in Glasgow, has a long history of ‘belonging’ to the local population, a kind of loyalty which Perth, for whatever reason, has not achieved? 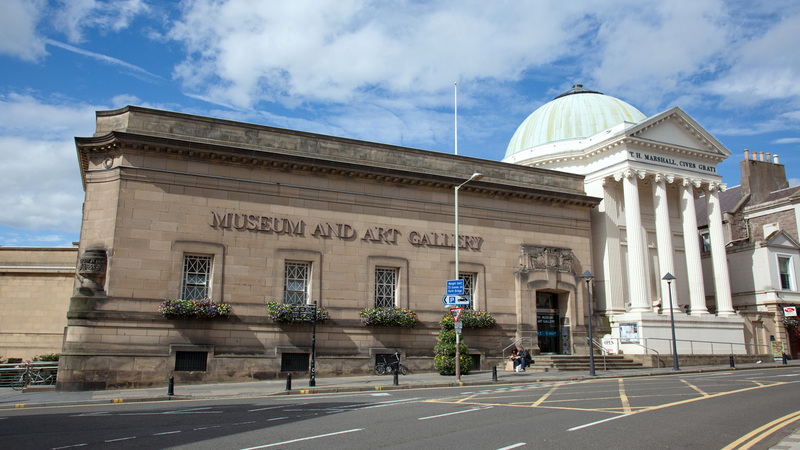 Like many Scottish Councils before them, Perth and Kinross have only just outhoused their Cultural Services—including the museums– to an independent trust, Culture Perth and Kinross . When the Highland Council set up the similar High Life Highland some years ago, that shift rejuvenated Inverness Museum and Gallery, which has to overcome the handicap of being in a truly ugly and unsuitable 60s block, so unlike the elegant classical buildings in Perth. Perhaps the advent of Culture Perth and Kinross will achieve a similar sea change, and Perth Museum and Gallery will finally be brought out of hiding.